As diverse as it is beautiful, Sri Lanka is an island ripe for discovery and stands as one of the greatest Asian countries for a fun-filled family vacation. The perfect destination for people of all ages, this country has everything from enchanting wildlife to captivating beaches, rich cultural landmarks and quiet resort towns, offering something for everyone. If you’re planning on visiting Sri Lanka with kids, it’s the right time to check our guide to the perfect family vacation in Sri Lanka. Thinking of finding a special family retreat for your Sri Lanka holidays? Check out this selection of the best family holiday villas to book this year. Is Sri Lanka a good family holiday destination? You may be questioning, what makes Sri Lanka a good family holiday destination. Well, from its diverse terrain to its culture-rich towns, there is something on this island that will satisfy both adults and children alike. In fact, Sri Lanka is an amazing place to take your kids, as it will allow them to get a taste of a new culture and landscape, try new foods and come face to face with some of the world’s most incredible wildlife. On top of that, it is a safe and peaceful country, full of friendly and helpful people. Is Sri Lanka safe for families? Visiting Sri Lanka with kids is perfectly safe, with its locals always boasting friendly smiles and welcoming visitors with open arms. In fact, according to Rough Guide, Sri Lanka is one of the safest destinations in Southeast Asia, with the crime against foreigners virtually unheard of. The only thing you should be aware of is that petty theft does occur across Asia, though it is less common here. Be sensible when carrying possessions, as pickpockets tend to target tourist spots, and make sure to avoid the most lively areas at night. 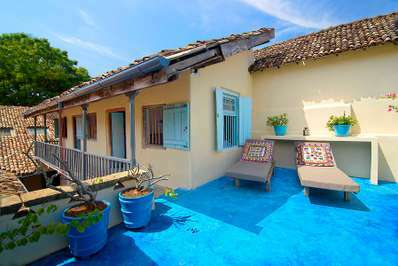 Finding family-friendly accommodation in Sri Lanka is straightforward, with its popularity meaning plenty of apartments and hotels have cropped up around the island. Although booking in advance is essential during peak seasons (December to March) as the country can fill up quickly and family rooms may be limited. As for where to go, Galle, Ella, and Mirissa are unmissable destinations for your family holiday in Sri Lanka, each offering everything from beaches to history and culture to pristine countryside. Dotted around the island, numerous private villas and vacation rentals will suit your family down to a T, with Villa No. 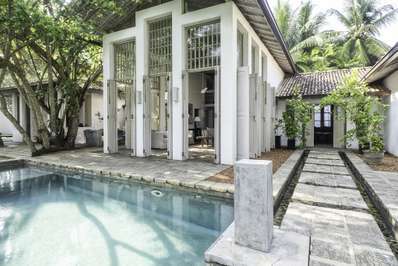 39 and Skye House boasting luxurious interiors and unique locations close to the sands of Galle and Max Wadiya offering panoramic beach views and a private swimming pool in the quiet village of Urawatta. Elsewhere, The Deer Park Hotel on the banks of Giritale Reservoir is ideal for families seeking an animal adventure, while D Canal House bed and breakfast lie close to the whale watching hot spots of Mirissa. What could be better for your trip to Sri Lanka with kids? From city exploring to animal encounters, Sri Lanka offers something for both adults and kids. Go whale watching in Mirissa, witness the temples of Anuradhapura, get up close with elephants and leopards in Yala National park, or take the gentle climb to the top of Lion’s Rock for breath-taking panoramic views. The train ride in Sri Lanka is an experience your kids will never forget about! Another must for families is the train ride through Hill Country, from Kandy to Ella, taking in some of the island’s greatest scenery, stopping off at Uva Halpewaththa Tea Factory and witnessing the world-famous Nine Arches Bridge along the way. Adrenaline lovers can also take a hot air balloon ride over the plains of Kandalama, while culture vultures can soak up the majesty of Sigiriya Fortress! If animals are your scene, make sure you check out our guide to the cutest wildlife that the country has to offer, to make your family vacation in Sri Lanka truly memorable. The island’s beaches will help make your trip to Sri Lanka with kids truly special. Sri Lanka is home to some truly incredible beaches where you can unwind, swim and sunbathe without partying backpackers! Ambalangoda Beach is fantastic for families, with calm waves and untouched sands, while Arugam Bay offers unique elephant-shaped rocks, quiet stretches of sand and plenty of wildlife. Located next to Yala National Park, the surfer’s paradise offers the chance to climb elephant point or to explore the water-side temple of Muhudu Maha Viharaya. You can also enjoy a lagoon safari to witness the area’s crocodiles and elephants. Mirissa Beach is perhaps the best for a trip to Sri Lanka with kids, with palm trees, clean sands, affordable accommodation and the opportunity for whale watching, this region is perfect for your little ones. You can also try surfing and snorkeling in its sublime waters. Located in Jaffna, Casuarina Beach also offers a blend between sun, sea, sand and cultural opportunities, with Aanjaneyar Temple right by the shore. If you want to find yourself alone by the sea, then Balapitiya Beach is another fantastic option. Whichever one you choose, a trip to these shores will make for a truly memorable family holiday in Sri Lanka. You can also check out our guide to Sri Lanka’s best beaches! Are you feeling inspired for your family vacation in Sri Lanka? If you want to take the strain out of your trip to Sir Lanka, then why not consider booking a family tour? From week-long adventures to unforgettable day trips, there is a tour in Sri Lanka to suit all needs. Designed for kids aged nine to 16, Exodus Travels offers a great 14-day family tour where you will witness the best of the island, while Best of Sri Lanka offers a nine-day trip to experience the wildlife and attractions of the country. If you’re looking for day trips to remember, which will break up your adventure and allow you to take a moment to relax, then why not consider booking a family-friendly trip? Take a look at our dedicated tours and experiences, which you can enjoy for free when signing up for our rewards program. Traveling with kids isn’t always easy. In fact, it can be quiet tiring, so if you find yourself wanting some time to yourselves, be sure to check out the island’s babysitting and childminding services, where professional nannies will safely look after your kids while you enjoy some much needed R&R. Make sure your family holiday in Sri Lanka goes off without a hitch! Make sure your family holiday in Sri Lanka goes off without a hitch, by considering the following things before you fly. Be sure to tell your kids where they’re going and what they’re likely to be seeing and doing, to introduce them to the holiday and prepare them for the cultural change. Make sure you book as much accommodation and transport in advance as possible and remember not to overpack, because the more you have with you, the more you’ll have to carry! Remember to give your kids your contact information and get them to carry your hotel info too so that if they get lost, they will know how to reach you. It is also sensible to establish meeting points at landmarks and attractions, in case you get separated. You may need injections before you travel, so check with your doctor, and it is likely you will also need a VISA before travelling, so be sure to apply online in advance. Additionally, many places and companies offer family discounts so remember to ask for family tickets and savings at attractions and on public transport! Looking for detailed Sri Lanka travel plan? Check out our suggested seven-day Sri Lankan itinerary to help you plan the ultimate family getaway!